Four weeks on from the London bombings, the news business in Britain has changed forever. Mobile phones have turned members of the public into reporters and camera crews - "citizen journalists". The media are hungry for their digital images and eyewitness accounts. The BBC received 50 pictures from the public within an hour of the first bomb going off on 7 July. By the weekend it had 1,000 images and dozens of video clips sent by e-mail and direct from mobile phones. 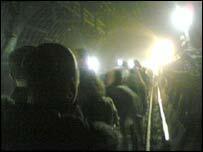 Two mobile phone sequences were used on the Ten O'clock News, powerfully conveying the claustrophobic atmosphere on the smoke-filled underground, and a still image from a phone dominated the BBC News website. Around 22,000 texts and e-mail messages poured in with personal testimonies on the first day. Other newsrooms were also inundated, and soon actively soliciting the public's help. The Metropolitan Police, anxious to examine the pictures for clues, set up their own e-mail address to bypass the media middlemen - images@met.police.uk. 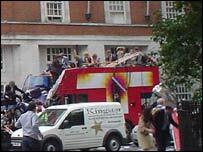 By 21 July, the day of the four attempted bombings, and the arrest of the suspects a week later, a routine had been established. 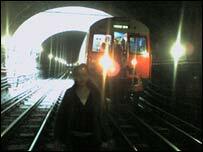 Everyone with a mobile phone or a DV camera knew the power of their images and eyewitness accounts - and what to do with them. The BBC received 67 pictures and 13 videos on 21 July, and a further 20 pictures on the day of the suspects' arrests. On Sky News, one woman gave a running commentary as police, through a loudhailer, tried to persuade one of the suspects to give himself up. On BBC Radio, another eyewitness was interrupted on-air by what sounded like explosions. ITV News was handed remarkable footage of the moment two of the suspected bombers were arrested on a balcony. This high-quality video - taken by an eyewitness on a DV camera - was worth thousands of pounds. ITV shared the cost with a newspaper, screening it with the caption "EXCLUSIVE - ITV News/Daily Mail". Steven Barnett, Professor of Communications at the University of Westminster, said the public is "much more media-savvy" than before. "People are aware of what constitutes important news stories and the commercial opportunities - that media organisations are much more competitive than they were and there is some money to be had from selling on exclusive footage of breaking news stories." Most images from mobile phones won't be paid for. The BBC insists the pictures it receives are royalty-free, to be published in any way it chooses. Sky News says it depends on their quality. A spokesperson for Sky said: "In the four weeks since the bombings, we have seen a significant upturn in the number of mobile phone images supplied, for the arrest of the terrorist suspects and also for other events such as the Birmingham twister. "We judge each offer of pictures on a case by case basis and would consider paying for footage on rare occasions where pictures have extraordinary editorial value." Broadcasters and newspapers are also now less concerned about the quality of the images. Roger Tooth, head of photography at the Guardian, said: "As newspapers, we're using grainy, coarser images that we wouldn't have used before. "We're using more TV stills and we're using these camera phone pictures. There was an amazing picture from the tunnel on 7 July which I just didn't think we could use very big and yet the Telegraph used it as a half page and it did look amazing." The rise of the citizen-journalist is a global phenomenon - witness the Toronto plane crash this week, in which escaping passengers took the time to photograph the scene. It does raise issues of concern: About privacy - if you're a victim do you want your picture plastered over the front pages? ; authenticity - how can you tell the images are genuine? ; and possible interference in the course of justice - the police ordered a news blackout on the morning they went in to arrest suspects. But the mobile phone genie can't be put back in the bottle.